Brazil accused the US of double standards, and Turkey insisted Thursday that rejecting the deal with Iran, which calls for Tehran to ship around half its stock of low-enriched uranium to Turkey in exchange for enriched uranium suitable for research and medical use, would be “unreasonable” and said that a US push for fresh sanctions on Tehran was creating an “absurd situation”. “Those who speak to this issue should eliminate nuclear weapons from their own country and they should bear the good news to all mankind by doing that,” Turkish Prime Minister Recep Erdogan said while attending a UN conference in Rio de Janeiro. Now it is the turn of Iran to accuse Russia, ever so politely, of double standards. The pretense that the leader of a modest country like Kyrgyzstan can play his own little game in big league politics is shed with the ouster of the tulip revolutionary president Kurmanbek Bakiyev, after last week’s riots in the capital Bishkek that left 81 dead and government buildings and Bakiyev’s various houses trashed. Bakiyev tried to have the best of both big power worlds, last year brashly threatening to close the US airbase, vital to the war in Afghanistan, after signing a cushy aid deal with Russia, and then reversing himself when the US agreed to more than triple the rent to $60 million a year and kick in another $100m in aid. As a result he lost the trust of both, and found himself bereft when the going got tough last week, as riots exactly like those that swept him to power erupted. 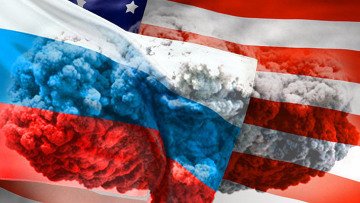 The US administration is preening itself on finally clinching a new Strategic Arms Reduction Treaty (START) with Russia, President Barack Obama calling it “the most comprehensive arms control agreement in nearly two decades”. It is to be signed in Prague 8 April, where Obama launched his campaign for a nuclear weapons-free world a year ago, and which was supposed to get a US missile defence base. Obama axed this, at least for the moment, to mollify the Russians. Despite it being the only flicker of peacefulness out of Washington “in nearly two decades”, the reaction in the US is one of indifference or hostility as the right now latches on to each and every Obama initiative to show its displeasure over healthcare and other Obama-inspired liberal policies.